I just installed Windows 10 on my laptop, but I'm having a problem with the screen fading so dark I can hardly see it. I've tried adjusting the screen brightness manually on the laptop by pressing the FN (function) key + up arrow key, but the screen brightness won't say - it keeps going dark automatically on its own. The screen goes dim whether or not I have the laptop plugged into the power outlet, or if it's running on battery. It also seems to happen immediately as soon as I login to Windows. I have tried changing the Power Settings (via Control Panel) so that the adaptive brightness is turned off, but that doesn't seem to make any difference. Can you help? " This is a very typical problem and usually happens when new Windows operating systems are released. The root cause is either one of the following: either the video drivers aren't fully up to par with the new operating system, or there are bugs in the operating system which are interfering with how the adaptive brightness feature is supposed to work. Thus, some laptop users will have strange display issues as Mary described. There are a few things you can try, and I'll explain how to do that step-by-step below. Please note that these steps work for Windows 7, 8, and 10. The first thing you can try is to disable the Adaptive Brightness feature via the Power Options menu inside of Control Panel. To do so: click Start, then type in "power options" (no quotes); wait for Power Options to appear in the list, then click it. You should now see a heading that says "Preferred plans" and a plan underneath that is already selected. Click the link next to the selected plan that says "Change plan settings" (pic). 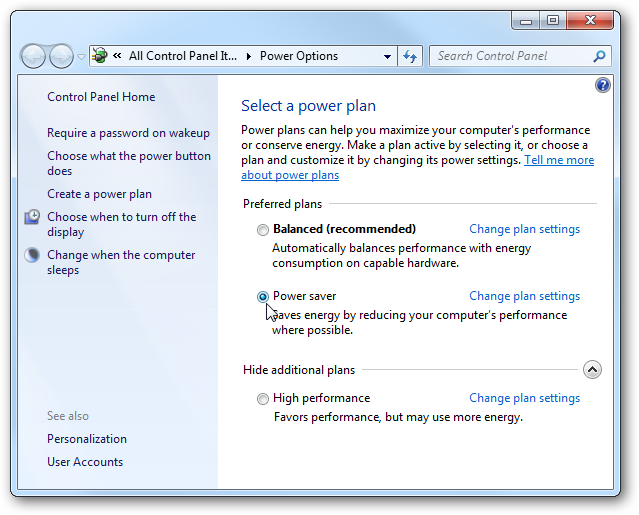 The "Edit Plan Settings" window will now appear; click on the link that says "Change advanced power settings". A new window will appear with the title "Power Options". Scroll down the list until you see an option for "Display Brightness" and put both "on battery" and "plugged in" at 100%; scroll down a bit more and do the same for "Dimmed Display Brightness"; scroll down more until you see "Enable adaptive brightness" and put "On battery:" and "Plugged in:" to both off. Finally, click Apply, then OK. Proceed to test whether or not the adaptive brightness feature has been disabled (described next). a. Unplug your laptop from the wall; this usually (instantly) causes adaptive brightness to 'kick in'. If nothing changes that is a good sign, but just to make sure - try step (b) below. b. Another way to make adaptive brightness 'kick in' is to reboot the machine and login to the computer. Before you reboot, bookmark this page so you can come back to it. As soon as you log back into Windows, the adaptive brightness should 'kick in'; if it does not, then you are good to go and nothing else needs to be done. If the adaptive brightness is still enabled, proceed to the next step. Right click the above text with your mouse and select "Copy" from the dialogue menu. Next, click the Start menu, then type in "cmd" (no quotes); wait for "CMD.EXE" or "Command Prompt" to appear in the list, then right click it and select "Run as Administrator". A black command prompt window should now appear; right click in the middle of the window and select "Paste" from the dialogue menu. The commands you copied above should now be output onto the command line. For all intents and purposes, the adaptive brightness should be completely disabled now. You can test to see if the adaptive brightness has been disabled by following the section "How to Test Adaptive Brightness" in Step #1. If still no luck, proceed with Step #3 below. As I mentioned previously, issues often arise with the adaptive brightness when a new version of Windows comes out because there are bugs in the operating system or video driver (or both). Another way to resolve the adaptive brightness problem is to either update your video card driver (if an update is available), or use the stock Microsoft video card driver. Click Start, then right click "My Computer" or "This PC", then select "Properties". The "System" window will appear; on the left side you will see a link to "Device Manager" - click that. The "Device Manager" window will now appear; scroll down the list until you see "Display Adapters", then expand the list. Your display adapter name and model number should be displayed - make note of both. Next, open a browser window and search for your adapter name and model number in google, followed by the word "driver". For example, if your display is an "AMD Radeon 5700 Series", then search for "AMD Radeon 5700 Series driver". Alternatively, you can go straight to the manufacturer's website and download the latest driver there; if it's an AMD video card, then go to amd.com to find the driver. If it's an Nvidia card, then go to nvidia.com to find the driver. Once you have the driver updated, try testing the adaptive brightness as mentioned in Step #1. Roll back to "Microsoft basic Display Adapter"
If still no luck, you can try using the "Microsoft basic display adapter". I advise against doing this unless everything else I mentioned above fails, because this display driver is extremely basic and may not allow your monitor to display in the proper resolution. Go back to the device manager (as mentioned above), then double click on your display adapter to edit its options. The "Properties" window should now appear; look for an option that says "Update Driver" and click it. Windows will now present you with two options: "Search automatically for updated driver software", or "Browse my computer for driver software" - choose the latter. A new window will appear asking for the path of the driver you wish to install; further down you will see an option to "Let me pick from the list of device drivers on my computer" - choose that. The next window will appear with the title "Select the driver you want to install for this hardware" - choose the option that says "Microsoft basic display driver", then click Next. Follow the instructions on the proceeding screens; you will probably need to reboot to make the changes take effect. If the above article is over your head or if you are having display issues with your monitor, I can help using my remote desktop support service. Simply contact me briefly describing your problem and I will get back to you as soon as possible.